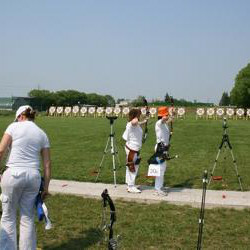 The archery field stays together with a field dedicated to the Olympic games and to a field with 3 dimensions targets. Sports and recreational activities are organized during the year. The company is affiliated to FITARCO from 1991 and from this organism gains adresses common to all Italian archery companies. From 1998 the company is part of C.O.N.I. (Italian national olympic committee). From 2001 the company is affiliated to Polisportiva Zola.